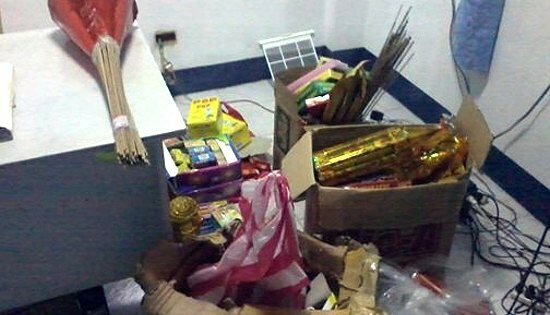 Assorted firecrackers/pyrotechnic devices confiscated by the Regional Special Operations Group 8 (RSOG8) in an operation conducted in Catbalogan City on December 31, 2012. CAMP SEC. RUPERTO K. KANGLEON, Palo, Leyte – The Police Regional Office 8 (PRO8) noted a significant decrease in firecracker-related injuries as revelers met the year 2013. Police Chief Superintendent Elmer Ragadio Soria, PRO8 Regional Director, said 2012 recorded a lower rate of firecracker-related injuries as compared to the 2011 Yuletide season. “This can be attributed to the government's public information and education campaign and the intensified crackdown on illegal firecrackers waged by our men in the field,” Soria said. Citing data from the Aksyon: Paputok Injury Reduction Registry on Firecracker-related cases from the Eastern Visayas Regional Medical Center in Tacloban City, Soria informed that from December 16, 2012 to January 1, 2013, only three firecrackers-related incidents resulting in blast/burn type injuries and one eye injury were recorded. The 3 blast victims includes a 76-year old male, a 10-year old boy and 9-month old baby boy who were wounded due to “piccolo” firecracker while an 11-year old boy sustained eye injury due to lantaka or homemade cannon. All were sent home after receiving proper treatment. The Regional Epidemiology and Surveillance Unit of the Department of Health Regional Office 8, however, have no available data on the matter as of this writing while PRO8 records showed 7 victims with Eastern Samar posting the highest with 3 victims while Tacloban City and Leyte province posted at 2 victims each. Soria further disclosed that his office has not monitored any indiscriminate firing incident and victims of stray bullets regionwide. The above figure is lower as compared to the same period in 2011 from the PRO8 and DOH 8 records with a total of 23 firecrackers-related incidents that had caused the same number of injuries and one injured due to stray bullet. "This reduction to a very significant level of firecracker-related injuries and casualties is credited to the vigorous advocacy and close coordination among the police and other government agencies, non-governmental organizations, and the media to ensure the security and safety of the general public and attain a generally peaceful and violence-free Yuletide celebration,” Soria said. Days before the New Year and on New Year's Eve, PRO8 launched an intensified crackdown on illegal firecrackers with line units conducting seizure and confiscation of dangerous and prohibited firecrackers, including the "Piccolo', a brand of firecracker that Department of Health has identified as the leading cause of firecracker-related injuries. Other seized firecrackers were Judas belts, rocket launchers, whistle bombs, super lolo, lolo thunder, pla-pla, Pacquiao, goodbye Philippines and great bawang. PASAY CITY – Senator Chiz Escudero expressed disappointment over the Presidential Commission on Good Government’s decision to end its search for the Marcos loot and said the agency must now properly account for all ill-gotten assets it has recovered. "That it was difficult to recover the Marcos loot should not be an excuse if there was indeed a cause of action,” Escudero said. The senator, who chairs the Senate Committee on Justice and Human Rights and sponsor of the bill seeking compensation for victims of human rights abuses under the Marcos regime, said it was disappointing that the PCGG was now giving up the search for billions of pesos suspected to have been stolen by the late strongman Ferdinand Marcos, his cronies, and his family. "Everybody agrees that the hunt and recovery was not going to be a walk in the park. But it’s disappointing that they are throwing in the towel now and saying that they can't prove the case against the Marcoses anymore,” he said. PCGG Chairman Andres Bautista cited several reasons for ending its search for an estimated $10 billion in ill-gotten wealth of the Marcos family, including the return to power of some members of the Marcos family, and the government's belt-tightening measures which now made the pursuit costly and prohibitive. Last year, Escudero backed a plan to abolish the PCGG, which was created by the late President Corazon Aquino to recover all of the Marcos' ill-gotten wealth. Bautista said he already gave his recommendations to President Benigno Aquino III to wind down its operations and transfer its work to the Department of Justice. "There have been pending bills in Congress seeking its abolition. This is actually a good move, one less funding for the government which can appropriate funds to other important programs,” the PCGG chief said. Aside from turning over all pending cases against the Marcoses and their cronies to the DOJ, Escudero said the commission should also account for all the assets that it had recovered and confiscated since its creation and turn it over to the Department of Finance. "We want a full audit and accounting of all the sequestered assets and its value at that time, especially those that have since been dissipated as well. Present to the public the current value of its forfeited assets to address long standing allegations against the PCGG that its officials helped squander the little assets the agency had recovered," Escudero said. The senator said the PCGG should also make public all the compromise deals it has made in the past, how much did the state gain or lose. "The last thing we want to discover is a tale of the fabled loot being looted twice over," he said. Bautista, who took over the commission two years ago, had admitted that the "long-term chronic mishandling of the PCGG that led to an unmanageable paper trail and evidence went missing that led to bitter losses in litigation." MANILA – Vice President Jejomar C. Binay has instructed the Home Development Mutual Fund (Pag-IBIG) to appeal a recent Makati court decision, emphasizing that the case is not the main case of syndicated estafa filed against Globe Asiatique (GA) head Delfin Lee and several others. Binay said the decision does not absolve Lee and his co-accused and added that GA is only trying mislead the public by filing a lot of incidental cases. "Globe Asiatique is trying to mislead the public by claiming a legal victory but this is not the main case of syndicated estafa," Binay said. He also pressed law enforcement authorities to intensify their manhunt for Lee, who remains in hiding. Government has put a P2 million bounty for his arrest. For her part, Pag-IBIG’s president and Chief Executive Officer Darlene Marie Berberabe said GA did not win in the syndicated estafa case which is the main case in contention. “GA filed a lot of incidental cases. And there is one civil case that they filed against Pag-IBIG to force us to respect the contract we had with GA,” Berberabe said. “In that specific case we questioned the propriety of suing the Pag-IBIG board which isn’t an entity. The court said it is ok to sue the board even if it is not an entity. That is all. The court did not rule on the merits. Minor points itong pinag-uusapan,” she added. Berberabe was referring to the recent decision of the Makati Regional Trial Court, Branch 58, declaring Globe Asiatique and its owner, Lee, are entitled to specific performance and right to damages against HDMF, better known as Pag-IBIG Fund. Pag-IBIG accused GA of using a "modified Ponzi" scheme to siphon off money amounting to P6.6 billion from the Pag-IBIG Fund to develop its Xevera projects in Pampanga. The Supreme Court (SC) had earlier decided to junk a petition filed by Lee which seeks to stop the Department of Justice (DOJ) from prosecuting him in connection with the syndicated estafa charges filed against him and other executives of GA. The Pampanga RTC also found probable cause against Lee and his co-accused and issued warrants for their arrest with no recommendation for bail. MANILA – The Office of the Vice President (OVP) today asked Philippine National Police (PNP) Central Visayas Regional Director Chief Supt. Marcelo Garbo to abandon his plan to physically remove Governor Gwendolyn Garcia from the provincial capitol before January 1, 2013. It also asked the general if he was prepared to guarantee that there will be no injuries or casualties as a result of the planned removal of Garcia. Lawyer Ira Pozon, head of the OVP Special Concerns Office, also asked Garbo to state if he was acting on his own or on orders from DILG Secretary Mar Roxas or PNP Chief Director General Allan Purisima. Garbo was earlier quoted saying that he will only remove Garcia from the capitol if he is ordered to do by higher authorities. “Does this mean that you have received orders from higher ups, particularly the Secretary of the Department of Interior and Local Government or the Director General of the Philippine National Police, or are you acting on your own?,” he said. Pozon reminded the police general that Garcia has brought the issue of her suspension before the Court of Appeals, with a prayer for the issuance of a Temporary Restraining Order. “Due process and the rule of law, not to mention judicial courtesy, require that you hold in abeyance your decision to remove the Governor from the provincial capitol. “As a law enforcement officer, your responsibility is to maintain peace and order, not to fuel unrest or spark protests. We hope that you will be discerning and responsible enough to realize that physically removing the Governor from her office while the process of appeal is not yet complete invites charges of abuse of authority and violation of due process,” he said. “Moreso, such an act invites counter-actions that could have political consequences beyond your control,” he added. The OVP also took a jab at Garbo for reportedly claiming that his promotion to two-star rank should not delayed or prejudiced by his action against the Cebu Governor. MANILA – The United Nationalist Alliance (UNA) today said the political agenda of the Liberal Party and its presumed presidential bet in 2016 Mar Roxas is endangering the President’s reform agenda and could erode the people’s trust in his administration. “The people have very high expectations of the present administration. They want jobs and a better life. They are fed up with the previous regime’s lust for power. They want more governance and less politics,” UNA Secretary General Toby Tiangco said. But the Liberal Party’s power grab in Cebu “is a return to the discredited mindset of politics at all costs,” he said. “The obsession of DILG Secretary Mar Roxas and the administration party with capturing power in 2013 in preparation for Roxas’ all-but-declared presidential bid in 2016 is endangering the President’s reform agenda and could erode the people’s trust and confidence in his administration,” he said. Tiangco also chided the Palace spokesman for “arrogance and self-righteousness” when he cited the “credibility” of the administration in differentiating its suspension of Cebu Gov. Gwen Garcia from the suspension of Vice President Jejomar Binay during the Arroyo regime. “What he is saying is that because the present administration is more popular and credible than the Arroyo regime, it can get away with political harassment,” Tiangco said. “He is saying that the administration party can use the power of government and misuse the laws to go after political opponents. It has a license to politically kill its opponents, so to speak, because it is credible and popular,” he added. “The administration spokesman’s arrogance and self-righteousness could very well erode the people’s trust and confidence,” he said. Tiangco also took issue with the Palace spokesman’s statement that the Vice President, who is the chair of UNA, should have convinced Governor Garcia to comply with her suspension order and leave the Capitol. Tiangco said when Binay was suspended in 2006, he was visited by former President Cory Aquino who encouraged the Vice President, who was then Makati mayor and leader of the United Opposition, to stand his ground because the order was illegal and violated due process. “She told the Vice President that to oppose an unjust order is to fight for democracy and the rule of law,” he said. “The suspension of the Vice President during the Arroyo regime and the suspension of Governor Garcia are both characterized by violations of the rule of law and the denial of due process. They constitute abuse of power,” he added. The UNA official likewise assailed the display of force when the orders were served. “In both cases, the orders were enforced with an intent to intimidate. How else can you describe the deployment of hundreds of policemen armed with high-powered rifles, the setting up of barricades, the dispersal of peaceful supporters, the closure of media outlets and even the shutting off of water service at the Capitol?,” he said. MANILA – With just four days until the new year, Greenpeace has a suggested new year’s resolution for Energy Secretary Carlos Jericho L. Petilla: abandon all plans to use nuclear power in the Philippines. The environmental group reacted with shock at the Department of Energy’s (DOE) recent proposal to revive the use of nuclear energy to help power the country. Greenpeace says, this plan goes against global trends as far as safety is concerned. “Worldwide, the nuclear industry is declining having failed to establish itself as a clean, cheap, safe or reliable energy source. The DOE’s new proposal to implement a national nuclear power program in the energy reform agenda is utter madness”, said Anna Abad, Climate and Energy Campaigner for Greenpeace Southeast Asia. “Nuclear energy cannot be good for the country as Secretary Petilla claims, because nuclear power is neither safe nor clean. No amount of technological sophistication or safety culture can prepare any country or its people to the inherent dangers of nuclear energy,” Abad added. Despite President Benigno Aquino Jr.’s public declaration that he was against the revival of the controversial Bataan Nuclear Power Plant, Petilla says that the Energy department was already looking into nuclear projects to attract local and foreign investors. No nuclear proposals are currently tabled in Philippine Congress. However, the Philippine Energy Plan still has provisions for nuclear energy. The Energy Reform Agenda directs the DOE to conduct research and studies in aid of legislative and executive action for the operation of a 2,000-megawatt nuclear power plant by 2025. “It may seem a cheaper alternative, but nuclear energy pays a human price. Just look at what happened in Ukraine, and very recently in Japan. Has Secretary Petilla has completely forgotten about the Fukushima tragedy, the world’s worst human-made disaster to date?” asked Abad. “His short sighted plan to put profit above people’s safety could put millions at risk. If a nuclear disaster cannot be prevented from happening in rich, technologically advanced nations like Japan, then what might happen in our county?” she added. The Aquino government has wasted several years pushing for dirty sources of energy such as coal and nuclear. The government must ensure sustainable development with a future powered by clean and safe renewable energy, rather than dangerous nuclear, or dirty coal power. Greenpeace is advocating an ‘Energy Revolution,’ a sustainable energy pathway for renewable energy, coupled with energy efficiency technologies, to become country’s energy backbone. Greenpeace is calling on the Philippine government to commit to fully implement the Renewable Energy Law to achieve a target of 50% renewables in the country’s energy mix by 2020. CAMP SEC. RUPERTO K. KANGLEON, Palo, Leyte – While everybody was celebrating the Christmas season, anti-illegal drugs teams of Police Regional Office 8 (PRO8) went on with their usual work, arresting a suspected drug pusher in the process and confiscating a total of P38,000.00 worth of illegal drugs. Eastern Visayas Director Police Chief Superintendent Elmer Ragadio Soria commended his men for doing their job instead of getting busy with the holidays. “For these men, the Christmas season means work, work and work,” Soria said, adding that appropriate recognition will be given to those who participated in the successful operations. Soria informed that at around 10:30 o’clock in the evening of December 22, at Del Rosario Street, Brgy 4 in Catbalogan City, joint elements of Regional Special Operations Group 8 (RSOG), 2nd Company of Regional Public Safety Battalion (RPSB8) and Catbalogan City Police Station led by Police Inspector Constantino Jabonete, Jr. arrested one Henry Durano y Alpino, 32, married, collector of Nestle’ Products and a resident of Purok 3, Brgy Mercedes, Catbalogan City. Alpino was nabbed after selling 2 heat-sealed sachet containing suspected methamphetamine hydrochloride or “shabu” with estimated market value of P1,000.00 to a poseur-buyer. The police team recovered from his possession the two P500.00 bills used as buy-bust money with serial numbers SQ885661 and KE841544 and one unit Honda XRM Motorcycle allegedly used in his drug trade with Serial and Chassis Number XRM11-037-022377 and Certificate of Registration No 74032716 issued by Land Transportation Office on October 30, 2003 to certain Rollo Saturnino Jr of Brgy Adela Heights, Gandara Samar. Police further recovered from the suspect one heat-sealed plastic sachet containing dried marijuana leaves worth P300.00. Alpino is currently detained at Catbalogan City Police Station lock-up cell while the PNP is preparing drug charges against him. Meanwhile, on Christmas eve, anti-illegal drugs operatives of Tacloban City Police Office led by Police Chief Inspector Jesus Son conducted buy-bust operation at Brgy. 39, Siren District. Suspect Mario Macawile however, eluded arrests after sensing that he was transacting illegal drug trade to a policeman acting as poseur-buyer, by running towards nearby houses bringing with him the P500.00 bill buy-bust money while the P500.00 worth of illegal drugs was left with the police officer. The police team conducted a brief chase to no avail but illegal drugs fell from the suspect’s pocket while he was evading the law enforcers. The items were seen in plain view near a well-lighted electrical post composed of 12 small sachets of “shabu” with market value of P6,000.00; one big sachet of “shabu” weighing more or less 5 grams worth P30,000.00 and two teabags of dried “marijuana” leaves. The items were brought to TCPO Police Station 2 for inventory and witnessed by Brgy. Tanod Dennis Anthony Dellera. Soria ordered a manhunt operation against Macawile as drug charges is being prepared against him. As this developed, Soria reiterated his call for active community involvement in the anti-illegal drugs war. “Everyone has a responsibility in combating the evils spawned by the illegal drug menace,” Soria added. PASAY CITY – Vice President Jejomar C. Binay recently renewed calls to institute reforms to improve efficiency and ensure effective and honest delivery of housing services to the people. Binay, Chairman of the Housing and Urban Development Coordinating Council (HUDCC), issued a a memorandum to the government's Key Shelter Agencies (KSAs) directing the submission of a report on the reforms the government have made in eliminating practices of red tape and corruption in their offices. “Corruption is an evil that weakens and destroys the trust of the people – the very foundation of a government," the housing czar said. "We are morally bound to institute reforms that would deter opportunities for corruption in every government transaction." Moreover, the Vice President also recently created a Transparency and Accountability Group (TAG) within the key shelter agencies to conduct fact-finding investigations on reports of alleged graft and corruption committed by personnel and officers of the shelter agencies. “The creation of the TAG would ensure that President Noynoy Aquino’s Daang Matuwid policy will be strictly adhered to by the housing sector," Binay said. The group is headed by HUDCC Secretary General Undersecretary Celia S. Alba. It will be recalled that Binay’s first directive upon his assumption to office as housing czar was to ensure that clients of the shelter agencies will be served under the principle of good governance and transparency. The Vice President’s intensive anti-corruption campaign resulted in the dismissal of some personnel of the Home Development Mutual Fund (HDMF or Pag-IBIG) who were found to have been involved in the illegal transactions of a real estate developer Globe Asiatique that apparently victimized innocent homebuyers. Under Binay’s guidance, risk analysis and extensive review of expenditure and revenue patterns have been implemented within the KSAs, which resulted in clearer targets and priorities and equitable appropriation of budget. “We have made every effort to ensure that the housing sector complies with the anti-corruption policy set by President Noynoy Aquino and the 2003 United Nations Convention Against Anti-Corruption (UNAC)”, Binay said. The Philippines is a signatory to the UNAC, which is observed every December 9th. CAMP SEC. RUPERTO K. KANGLEON, Palo, Leyte – The Christmas celebrations in Eastern Visayas was generally peaceful except for two fire incidents on Christmas eve and a burglary incident monitored by the police, Regional Director Police Chief Superintendent Elmer Ragadio Soria said. “While the people in the region are enjoying the Christmas eve and Christmas day celebrations with their families and loved ones, our policemen were on duty patrolling the streets so that our citizens can celebrate and enjoy the holidays peacefully,” Soria added. Soria noted the only incident that marred Christmas Day was a burglary in a parish convent in Tacloban City and two separate fires that hit a residential house in Tacloban City and public market of Can-avid in Eastern Samar. The region’s top police official has ordered a massive hunt for the thieves who carted away the personal belongings of Rev. Fr. Aaron Quilanita of Our Lady of Miraculous Medal Parish along Maharlika Highway in Brgy. 78, Marasbaras, Tacloban City. Investigators disclosed that the suspects may have entered between 1:00 o’ clock to 3:00 o’ clock in the morning of December 25 by bending the window grills of the parish convent. When the suspect/s were already inside, they went to the second floor and since the room of the Parish Priest was locked, they opened the sliding door leading to the terrace and using the cantilever on the side, went to the window of the room of Fr. Quilanita, bended the welded portion of the window grills and from there gain entry to the room. The burglars carted away one unit Apple laptop computer worth P60,000.00; four wristwatches branded Fossil, Bullova, Mossimo and Dilligaf wristwatch; one unit LCD projector and two mobile phones. In Sunnyville Subdivision in Manlurip, Brgy. San Jose also in Tacloban City, fire hit the house of Central Bank employee Allen Boquin at around 7:30 in the evening of Christmas eve, damaging the kitchen with an estimated P50,000.00 worth of damages. Earlier that day, fire also hit the rear portion of Can-avid Public market in Eastern Samar with estimated damages amounting to two million pesos. Soria said earlier that though PRO8 had not monitored any security threats during the yuletide season, it raised its security alert status to ensure a peaceful Yuletide celebration. “We will also conduct crackdown on the sale of illegal firecrackers and pyrotechnics to prevent injuries and incidents as the New Year’s celebrations draws near.”, Soria ended.